Matt is always working his magic in the kitchen and he channeled his 13 year old, Uggs and North Face wearing girl to make this recipe. Our Pumpkin Spice Latte Recipe will allow you to cut the costs of all those Starbucks trips and also channel your inner 13 year old self! Below, Matt will show you how to make the magical pumpkin spice syrup that is needed for this latte recipe! It's all, and I mean all about the pumpkin spice latte syrup. Matt out did himself with this recipe because the syrup on it's own is good enough to drink! We've had leftovers in the fridge since shooting the video and if I'm not squeezing it into my mouth, I'm topping all my foods with it, from keto bars to peanut butter. We used actual pumpkin puree along with pumpkin pie spice to create the intense, perfectly pumpkin flavored syrup! How To Make A Latte Low Carb Style! We found that the best way to make a latte low carb was to recreate the milk used in a normal latte with a 4 to 1 ratio of almond milk and heavy whipping cream! We even added some collagen peptides, which is entirely optional, to create the frothy texture you would normally get from a milk steamer. Classically this is a fall time drink, but who are we kidding... when it's low carb and has pumpkin spice in it, drinking it at all year long only seems right! As fall begins to approach warm drinks are becoming ubiquitous so if you haven't hit the basics, you should give our Keto Coffee and Turmeric Tea a try first! Next, you should venture into some baked goods that are perfect not only for fall, but for the holidays as well! We have amazing Pumpkin Cookies and a Pumpkin Pie Cheesecake. 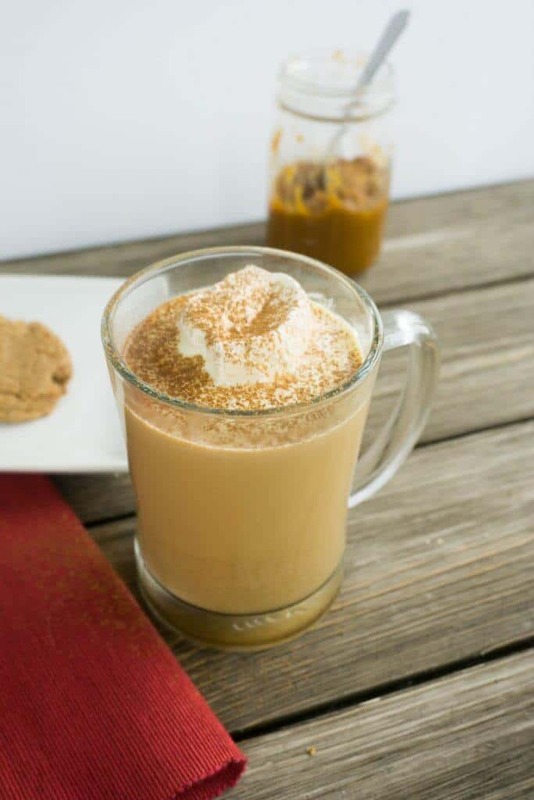 If nothing else, definitely make this pumpkin pie spice latte recipe to get you through the cold winter, and before you know it it'll be spring time again! Note: Any milk will work in this recipe, such as almond, cashew, or flax! If you have a milk steamer, even better - go ahead and use it to make your ultimate latte. 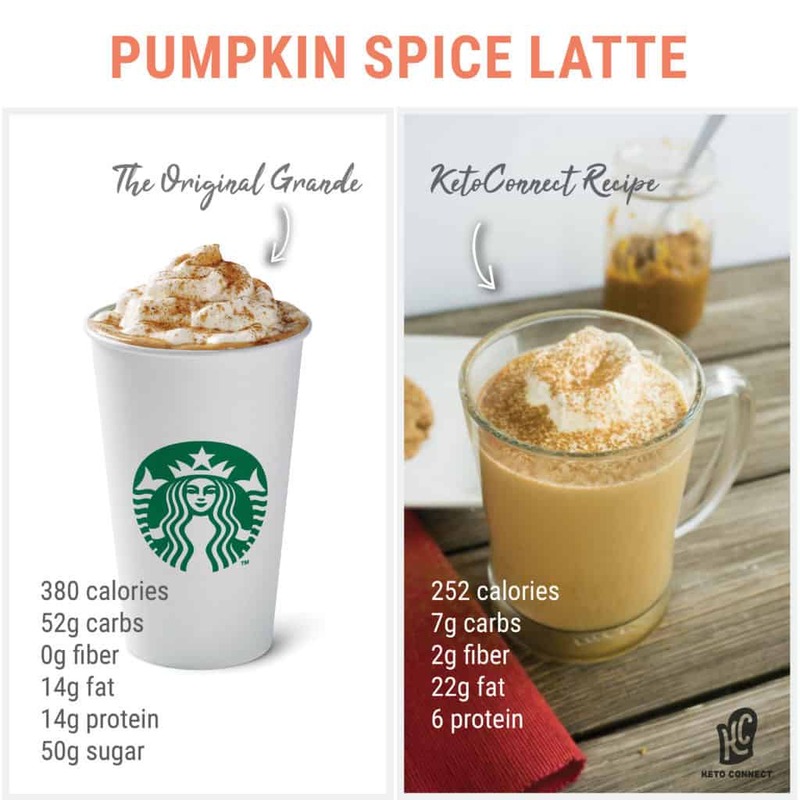 Recipe can be quickly added to MyFitnessPal - Search "KetoConnect - Pumpkin Spice Latte"
heat a sauce pan over low heat and add in the puree, water, erythritol and pie spice. Combine and allow to cook down for 8-10 minutes. You want a pumpkin pie filling consistency. Set aside. In a sealable jar add the heavy whipping cream, almond milk and collagen peptides and microwave for 1 minute. Seal the heated mixture and shake for 30-60 seconds. While the milk mixture is heating add your coffee (and water if using cold brew) to a coffee mug and set aside. Once the milk mixture is heated, add vanilla extract, stevia and 1.5 tbsp of the pumpkin latte syrup, and shake again. Pour the mixture over your coffee and additionally top the latte with a dollop of whipped cream and a drizzle of the leftover pumpkin latte syrup. Enjoy! Note: The syrup should last up to 10 days in the fridge and 2 months in the freezer!